Microgaming has released the revolutionary new game called My Slots that represents new generation of online gambling technologies. This 5 reel, 9 line video slot differs extremely from all slots you’ve seen before. For the first time you are able to customize the game refit right up to the background and, thus, to create your very own themes. But whatever your theme will be, top jackpot amount will remain the same – 10,000 coins or 50,000. Moreover, this game is decorated with Free Spins feature. What can be more interesting then to make your special theme thanks to which the fortune will surely smile upon you. To begin, you should enter the theme menu and to choose “The New Theme” button. You can now change the symbols by clicking on them and choose the photos and pictures in your computer to replace the symbols with. Only imagine that you can replace the usual symbols with Pamela Anderson photos or with your favourite photo whereon the elephant taped your mother’s-in-low foot. The initial game symbols are: Bell, Dollars, Bar, Orange and Cherries. Special symbols of the game are: Golden Coin and Diamond. Usual symbols are: Ace, King, Queen, Jack, Ten and Nine. Thanks to special option you can also re-size and cut the picture. Click “Confirm Symbol” to save it. You can choose color of the background and any music from your home collection. Don’t forget to name and to save the theme. As an example, we have chosen Mr and Mrs Smith movie to make our own video slot. When the theme is ready you should choose among following coin nominals: $0.01, $0.02, $0.05, $0.10, $0.20, $0.25, $0.50, $1.00. You can stake up to 5 coins per line. The minimum bet represents $0.09, the maximum one is $45.00. The highest my jackpot is 10,000 coins or $50,000 for 5 wild symbols. The second my jackpot is 2,000 coins or $10,000 for wild symbols. The third my jackpot is 750 coins or $3,750 for 5 symbols that you will choose to replace Bell and Dollars. The initial wild symbol of the game is Diamond. It plays the particular role in the game because it replaces the symbols lacking in the winning combination to make it complete. The scatter symbol is Golden Coin, it presents additional winning combination starting from 2 symbols. The maximum scatter win is $22,500. Moreover, you will win Free Spins if 3 or more scatters appear on the screen. Free Spins. You will activate this feature if you catch 3 or more scatter symbols anywhere on the reels. You will win 15 Free Spins with 3x multiplier, so, top jackpot can reach 150,000. Free Spins can be re-triggered. 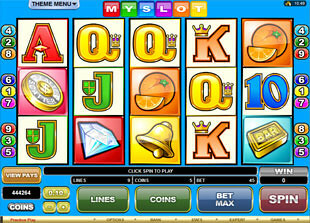 My Slot slot machine is sensational game that should be the first in the list of “must-play” games. You can give the full scope to your imagination by creating cool unique themes depending on your mood and wish. Choose your best photos to become the main hero in the game of infinite possibilities.